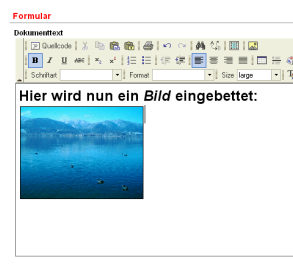 The last edition contained a very interesting tip which shows how to re-enable the “Add picture” feature for the FCKeditor. The article is only available in german, but with the help of Google Translation you should get enough information to follow the step by step instruction. For the translated version you have to scroll to the right to see the images. I don’t know why Google Translate is doing that. BTW, if you haven’t subscribed yet to the biweekly editions of the German APEX Community, you should do now! This entry was posted in Tips & Tricks and tagged html editor, image by Patrick Wolf. Bookmark the permalink. initially i was lost because i thought that this new HTML editor had replaced the existing one under “Textarea with HTML editor”, but as you remarked privately, there are two new brand elements in the Item type select list. There is one strange thing however that i don’t fully understand, if i try to enlarge a font, the resulting source code puts a font tag with a size attribute containing a number. Now, when this html snippet is finally rendered, the font size seems to be ignored, both in IE 7 and Firefox 2.0. Hi Patrick, how do you reset/clear the html editor when I press reset button in HTML? I’m not sure if I do understand what you mean with the “Reset” button. Can you create an example on apex.oracle.com to make it more clear for me? Sorry to made you confused. When I type some text in my html editor, and i press reset button, the text was not deleted. the problem is that the HTML Editor is no real HTML input field/textarea. Actually it’s an iFrame in a special mode. The underlaying textarea which APEX uses and which is hidden as soon as the HTML editor is rendered gets reseted to NULL as soon you press your Reset button. Hi patrick, how can you reference (URL) a picture from my #workspace_images# from HTML EDITOR? Hello i have a preview button in appex that i want to show what i have typed in my text area, can anyone help me how i can do that?